Binary Pair, 2008, installation (motors, lights, paint, ink), 6 x 14 x 6 feet / 1.8 x 4.2 x 1.8 m. // Anti-Campfire, 2008, charcoal, binding agents, light, solar power, 13 x 13 x 10 inches / 33 x 33 x 25 cm. 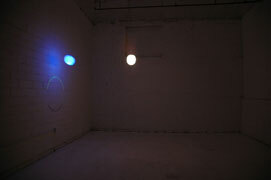 Foreground: Binary Pair, 2008, installation (motors, lights, paint, ink), 6 x 14 x 6 feet / 1.8 x 4.2 x 1.8 m. Background: Anti-Campfire, 2008, charcoal, binding agents, light, solar power, 13 x 13 x 10 inches / 33 x 33 x 25 cm. Installation view at Yerba Buena Center for the Arts, San Francisco. Binary Pair, 2008, installation (motors, lights, paint, ink), 6 x 14 x 6 feet / 1.8 x 4.2 x 1.8 m. Installation view at Tarryn Teresa Gallery, Los Angeles. 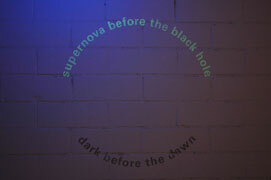 A kinetic installation and wall text. 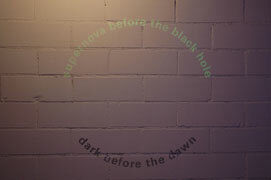 “Dark before the dawn” is in grey ink, better illuminated with the full spectrum light. 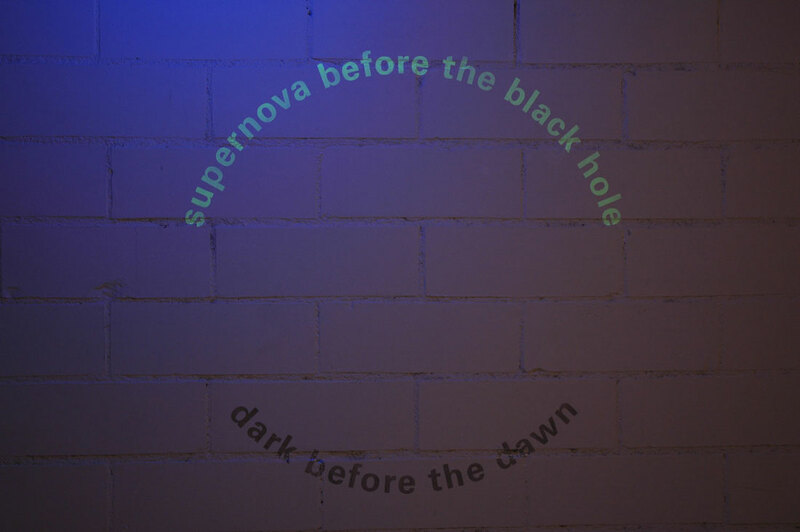 The text, “supernova before the black hole” appears in phosphorscent ink, glowing as the black light passes. 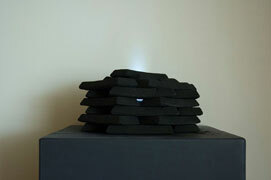 Anti-Campfire, 2008, charcoal, binding agents, light, solar power, 13 x 13 x 10 inches / 33 x 33 x 25 cm. 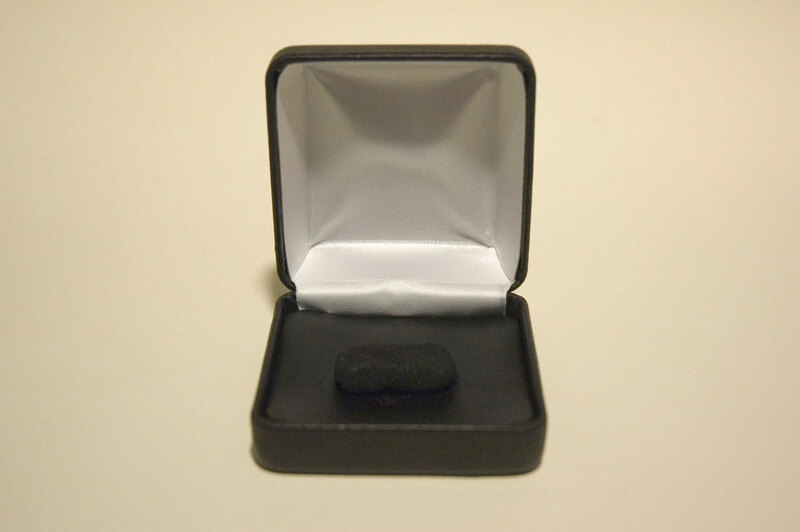 Miniature charcoal ingots, 2008, charcoal, binding agents, jewelry box, 2.625 x 2.625 x 1.75 inches / 66 x 66 x 44 mm each. Edition of 16. An editioned multiple housed in a jewelry box. 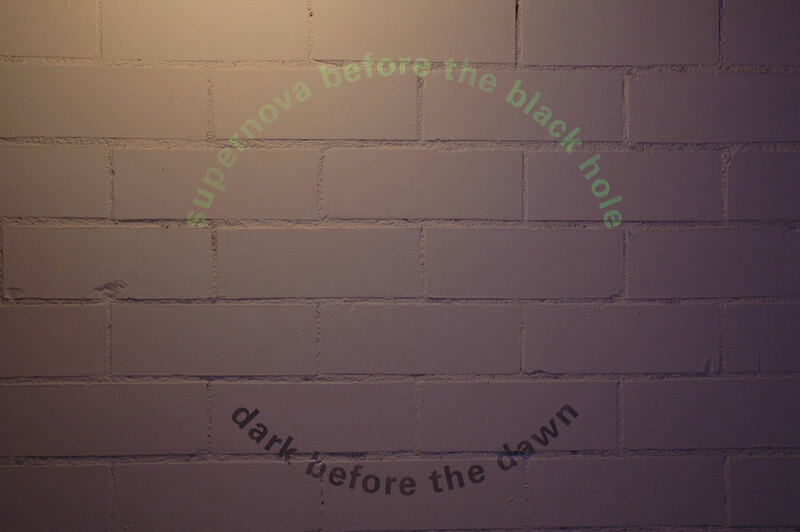 Binary Pair was inspired by pessimism and astronomy, namely the phenomenon when one star in a binary system collapses and forms a black hole, yet the other star remains visible. Inextricably linked polar opposites—in which darkness would annihilate light were it not for their mutual gravitational pulls—is a striking metaphor for the dialectical tension of optimism and pessimism. This speaks to ambivalence at the twilight of the American Century. 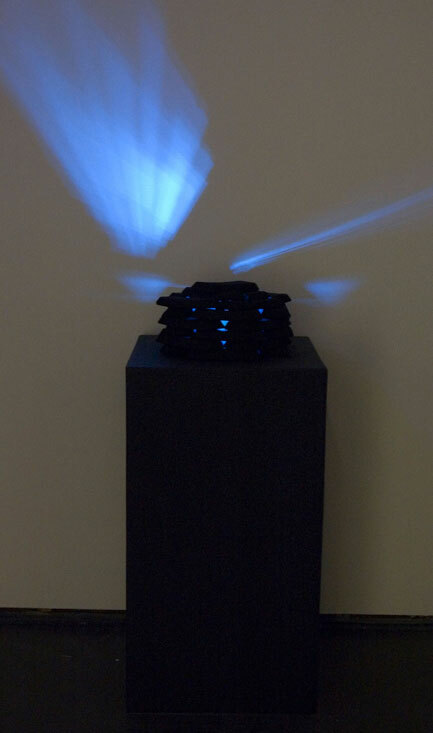 Caption: Christine Wong Yap, Binary Pair, 2008, installation (motors, lights, paint, ink), 6 x 14 x 6 feet / 1.8 x 4.2 x 1.8 m.
Binary Pair and Anti-Campfire were developed in dialogue with the works of Yason Banal for Galleon Trade: Bay Area Now 5 Edition. The exhibition is part of the triennial exhibition Bay Area Now 5 at Yerba Buena Center for the Arts (YBCA), as well as the Galleon Trade project, a grassroots exchange tracing the historical trading routes between California, Alcupulco and Manila. Binary Pair debuted in Los Angeles at Tarryn Teresa Gallery in Palimpsests, curated by Elizabeth Williams. Binary Pair and Anti-Campfire were made possible with contributions from General Pencil Company, and the generous technical assistance from artists Chris Bell and Erik Scollon. Anti-Campfire is an exploration of the similarities between energy (as in fuel) and will. Charcoal is primarily carbon—a dark element resulting from stored and expended energy. Light is the evidence of energy being expended. Similarly, optimism can require will, and the exhaustion of that will can result in pessimism. Caption: Christine Wong Yap, Anti-Campfire, 2008, charcoal, binding agents, light, solar power, 13 x 13 x 10 inches / 33 x 33 x 25 cm.